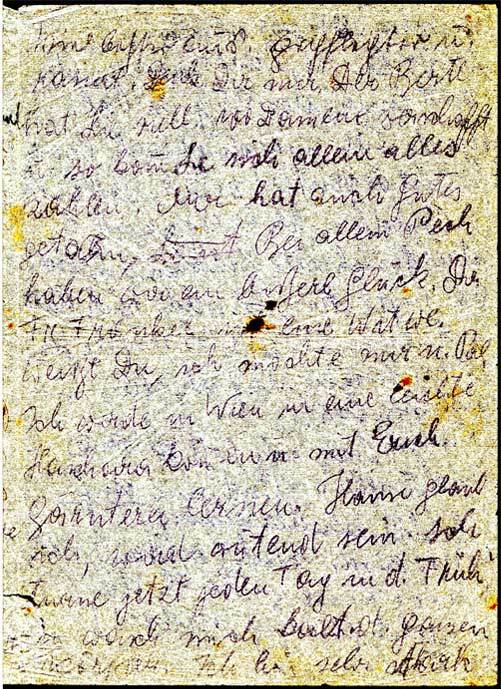 Sixteen year-old Anna writes with optimism and excitement about her and her cousin Erich’s prospects of getting to Palestine and reuniting with Gisella Nadja there. 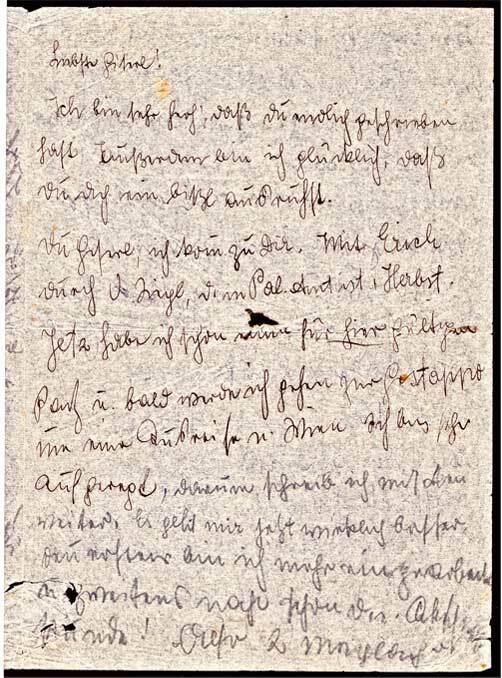 Anna also writes of the positive effects on the family of her father’s new relationship with the generous, sophisticated Mrs. Fränkel. The reader of Anna’s letter, who knows about the 1942 Nazi murders of Anna, her sister, Berta, her father, Hugo, and Mrs. Fränkel, will also find all of the other statements in Anna’s letter heartbreakingly poignant, including her statements of pride about her getting used to her work as a maid, her newfound strength and appearance and her thanking God for not being hungry anymore. I am very glad that you wrote at last. England. Hansi4 is doing splendidly. Daddy comes to visit me every day. Imagine, he5 is always shaved now. much better taken care of and shaved. Berta can pay for everything herself. luck, we have a little [good] luck. Mrs. Fränkel is a widow. 1000 kisses. Send photos again! Translated by Anne L. Fox, edited by staff of Sütterlinstube, Hamburg, Germany. 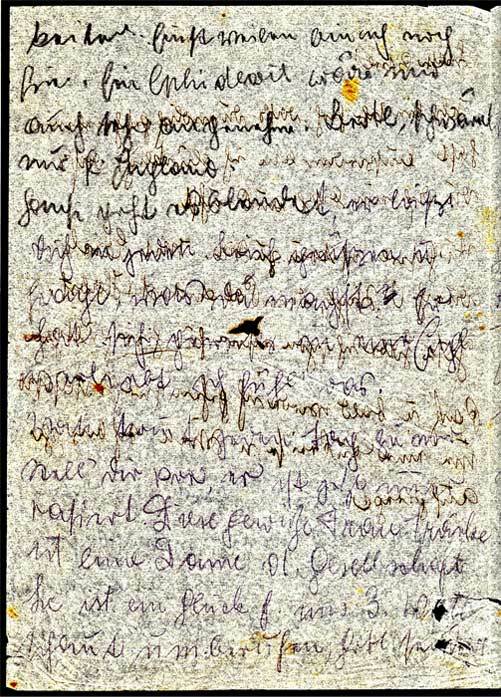 they were handwritten on both sides of a very thin piece of paper. 1. Hugo Jellinek was secretly engaged to Fritzi Fränkel by early July 1939. 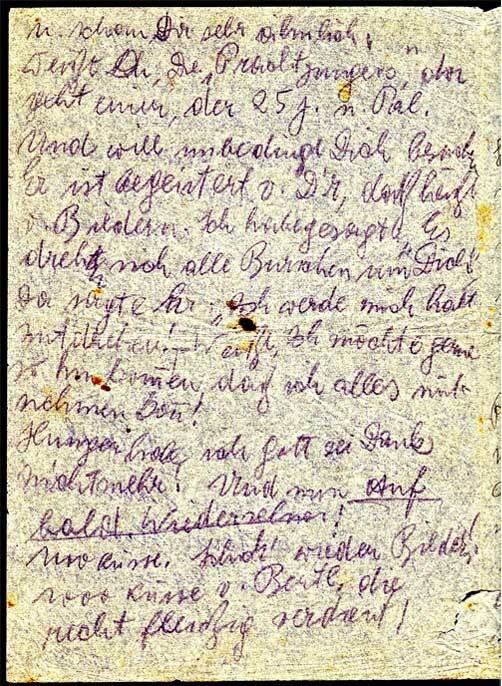 The date estimated for this letter is primarily based on Anna’s discussion of what seems to be an earlier stage of her father, Hugo’s quickly developing relationship with Mrs. Fränkel, and on Anna’s confident tone in her opening statements about going to the Gestapo and of getting to Palestine. 2. “Sigl” refers to Siegfried Jellinek, Anna and Gisella Nadja’s paternal uncle, who was working for the Jewish community of Vienna at this time. Anna therefore expected that he would be able to make the arrangements for the journey to mandate Palestine for Anna and for his own son, Erich. 3. Anna explains on page 3. of this letter, that she is planning to go to Vienna for a training program (known by its Hebrew name of Hachshara), to prepare her for work and life in Palestine. 4. Hansi was a friend of Anna’s and of her two sisters. “Hansi” is most likely the name Anna wrote here. 7. Hachsharot (singl. Hachshara) were Zionist -movement programs that provided agricultural and other vocational training, as well as group ‘socialization,’ to prepare prospective immigrants for a productive life in Mandate Palestine, especially in the Kibbutzim (collective settlements) there.